Genesis: A committee spearheaded by Jack Rose worked to form a club at WPHS that was chartered in 2008. Here's a video produced in 2009 with Georgene Mongarella narrating. It shows an active young Interact club deeply involved in fundraising for a cause. 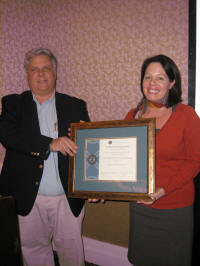 Our Certificate of Incorporation was signed by R.I. President D.K. Lee on December 16, 2008. Rotarian Jack Rose presented this certificate to Jodi Kennedy, our faculty advisor who is mainly responsible for the formation of the student club. By the time this club was formed, we already had 84 participating students. Wow! All interested in service to the community. As this club develops, we will give more information about Interact. Right now, we are proud of the enthusiasm this young new club has, and we will support its growth in the years to come. 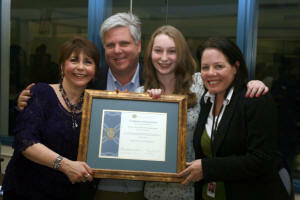 With parents invited to this meeting, we presented the charter certificate on February 5, 2009. From left: Rotary president Georgene Mongarella, Interact chair Jack Rose, club president Hannah Fine, and faculty advisor and founder Jodi Kennedy. 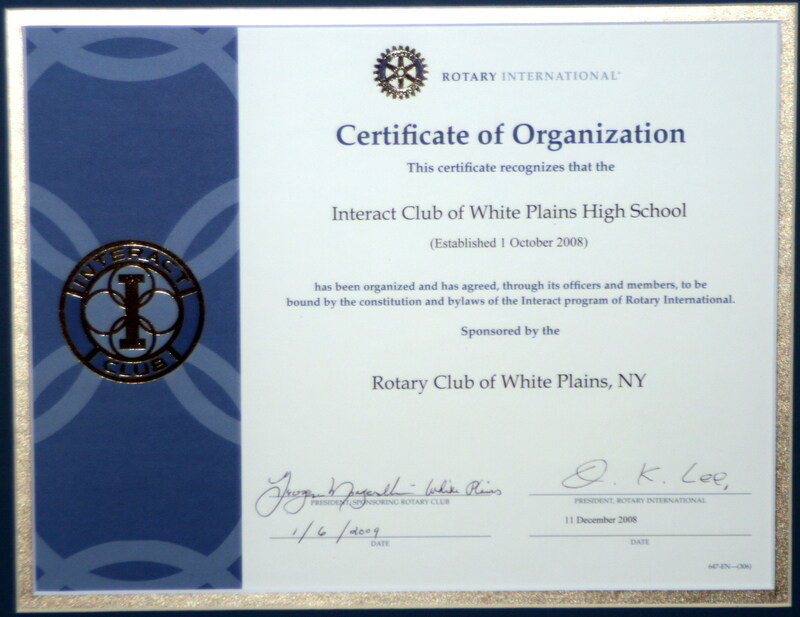 The new Interact club at White Plains High School launched last night with the White Plains Rotary awarding the club its official charter. More than 100 students — plus dozens of parents and Rotarians — were on hand, getting an overview of what the new club would be up to in the coming months. And let me tell you, these students will be busy! The club is working on a “Fashion for a Cause” fundraiser, with proceeds planned to go towards three ambitious projects: building an extension on a school in Ecuador, building three libraries in Uganda, and sponsoring a child from Russia to get a life-saving heart surgery through the Gift of Life Foundation. Designer Marc Echo has agreed to be one of the sponsors of the fashion show, which will also feature live music, food, and more. "I think it’s really important for kids to be able to see what is going on in the world and to take a stab to try to make it a better place," said Hannah Fine, 15, president of the Interact club. "We all live a life of privilege here, living in Westchester and White Plains. It’s necessary to have the chance to be able to give back. We’re so lucky to be able to make the world a little better by doing the things we love." For a closer look at the charter certificate, click the thumbnail to open a larger picture in another window.